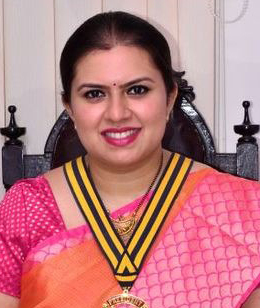 Mangaluru, Oct 1, 2017: Vathika Pai has been elected president of Kanara Chamber of Commerce and Industry (KCCI) for 2017-18. 28 year old Vathika Pai was elected to the post at the 77th annual general meeting of the members of KCCI held on September 28. Other office-bearers and directors of the board too were elected on this occasion. She is the 53rd and youngest president of KCCI. The other office-bearers are Isaac Vas-honorary treasurer, P B Abdul Hameed-vice-president, Shashidhar Pai Maroor-honorary secretary, Prashanth C G-honorary secretary. The directors are Nitte Yathiraj Shetty, K Ganesh Kamath, Aditya Padmanabha Pai, Amith Ramachandra Acharya, Praveen Kumar Bangera, Ananth G. Pai, Nissar Fakeer Mohammed, B A Nazeer, Ananthesh V Prabhu, K Dinesh Rao, and M Ganesh Bhat.